I was so looking forward to deciding on decorations for the baby’s room. Of course I had imagined what I wanted the baby’s room to look like the very first time we toured our house before we got pregnant, but once I got that positive pregnancy test, I could take action! If you recall from our house tour (I just looked at this post for the first time in years to get the link up… I’m going to have to do an updated house tour post! Perfect motivation to deep clean the house! The bare walls! The mismatched furniture! How the heck did we live like this??? For you Instagrammers, if you look up the hashtag #romeneskohousetour there are a few pictures of what our house looks like today), when we first moved into our house, we had a Packer room and a Brewer room. Pete claimed the Packer room as his own, so we transformed the Brewer room from a “I don’t know where to put this, so throw it in there” room to a guest room. It was so nice having a guest room that had a bed in it, instead of guests having to sleep on an air mattress or in the living room or something. I decided that our home would never go without a guest room, especially because we live far enough away from our families, that if someone comes to visit, they will be spending the night. In January, we cleaned out the guest room to start making way for the baby. We moved the guest bed into the Packer room. Pete’s computer stuff is still in there, so now we’re motivated to get the basement finished to have a guest room again. 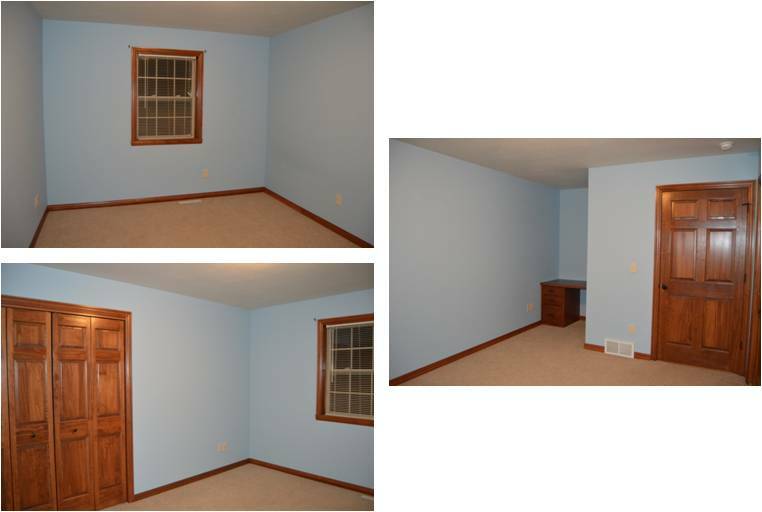 It was SO EXCITING seeing the room completely empty, knowing that we were customizing it for our little special someone! 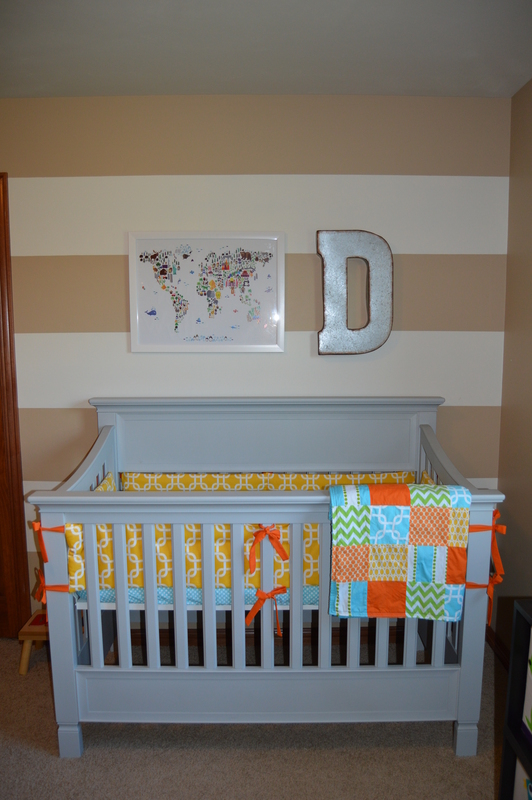 Since we didn’t know the baby’s gender, we needed a gender-neutral nursery. To be honest with you, even if we did know the gender, we probably would have gone with something gender-neutral because Pete and I both despise painting, so having to switch colors more than once in 100 years is a lot for us. Stripes are very in right now, so we did big stripes on one wall. We went wild with tan and cream. We didn’t want a specific theme for the baby’s room, like animals or anything. Instead, I focused on bright colors and books, since Pete and I are both avid readers. You guys. I LOVED DECORATING THE BABY’S ROOM. Most of the decorations didn’t get done until I was on maternity leave because we were waiting for the dresser to get delivered. Since it was one of the central points of the room, I wanted to have the dresser before hanging anything on the walls. Ugh, it was so fun. I got the alphabet from Etsy, and B made the bookshelves. We painted the shelves and the alphabet the same cream color as the stripes that are on the opposite wall. For the Vanderstappen shower, Jenna had everyone bring a book for the baby, so our bookshelves were full before baby Daniel arrived, and it made my heart so, so happy. My sisters, Marty’s girlfriend, and cousin Kelly went in on the bedding for us as a shower gift. We ordered it from Etsy. The woman that we worked with was fabulous. For no extra cost, you can tell her what fabrics you want for each thing (bumper, crib sheet, etc.) and she’ll customize it for you. So wonderful! 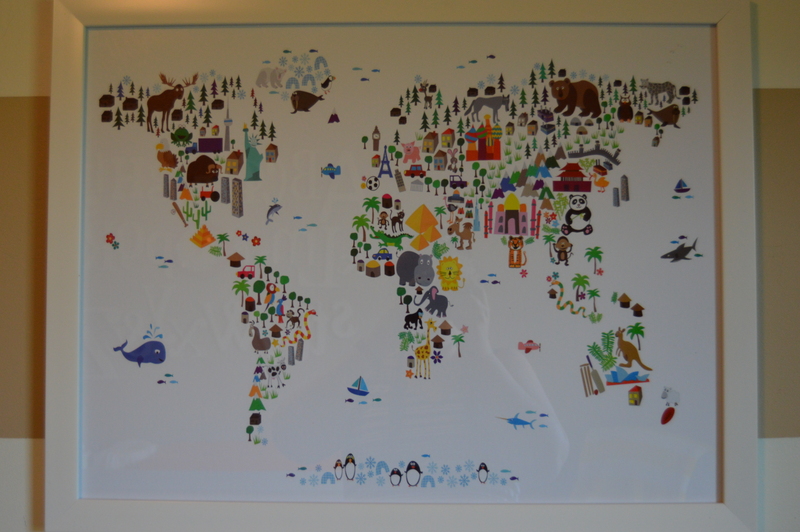 The map is from TJ Maxx Home Goods, but I ACTUALLY got it from my friend Amy. I had a vision of what I wanted on the wall above Daniel’s crib, and I had FINALLY found a picture on Pinterest of the PERFECT wall hanging. In addition to promoting reading at an early age, Pete and I really want to encourage travel and learning about and appreciating other cultures. My mission was to find this map somewhere… But I didn’t know where. The same evening that I finally found the wall hanging on Pinterest, Pete and I went to our friends’ house. As Amy was giving me a tour of their beautiful home, she opened a closet and there it was! She had purchased the map months ago and decided she didn’t want it. But she didn’t have the receipt so never returned it. Fate! I bought it from her, and it is just perfect in Daniel’s room. 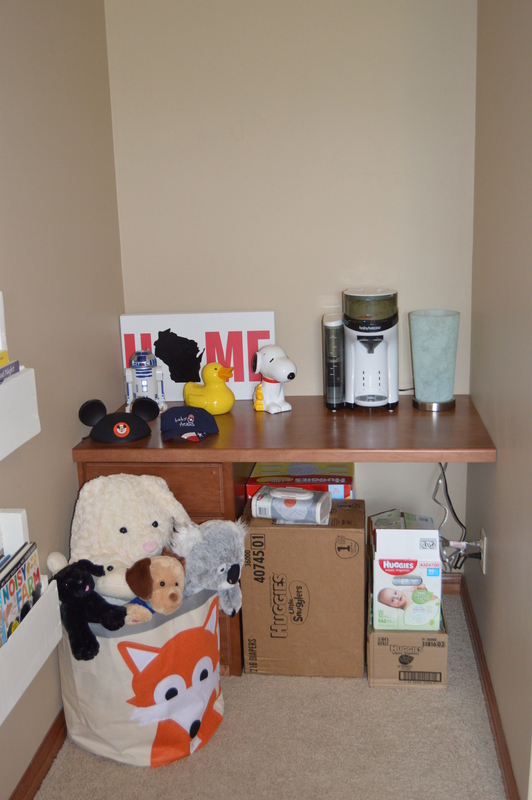 I’ve never been a huge fan of the built in desks in the kids’ rooms in our house (it makes it hard to arrange furniture – there are only like, 2 options for where we can put beds, dressers, etc. ), but we definitely put it to use in Daniel’s room! Perfect for diaper/wipe storage. Also perfect for… THE BABY KEURIG. 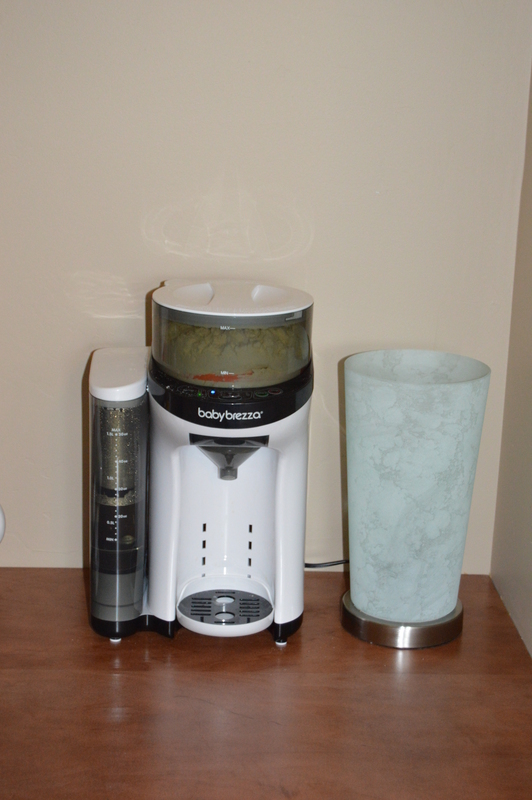 Officially the Baby Brezza Formula Pro, but it’s essentially a Keurig machine for formula. One of the most unnecessary inventions of all time, but you guys. I LOVE THIS THING. You push two buttons. First, you choose the number of ounces that you want. Then you push start. In about 30 seconds, a bottle is made that is the perfect temperature and already mixed, so there is no shaking involved. Since we have this set up in Daniel’s room, I put two bottles on the desk before bed, and then at the early morning feeding all I have to do is walk across the hall, and everything is right there. Fabulous! There are just a couple more additions that the room will have before it’s absolute perfection. Peter’s mom is making us curtains, so I’m excited to see how those look. In the closet, the shelving in there is really annoying and inconvenient, so we bought a closet organizing system from Ikea to put in there. Now to find the time to do it….